Journalists covering mass protests against the Venezuelan government of President Nicólas Maduro fought to carry out their work despite restrictions in the form of government detentions, physical attacks and harassment during the Oct. 26 “Toma de Venezuela” (Taking of Venezuela). Opposition leaders called on Venezuelans to participate in nationwide protests, labeled the “Taking of Venezuela,” after the opposition-majority National Assembly voted to open criminal and political trial proceedings against Maduro for violating the constitution. This happened days after the National Electoral Council suspended a campaign to collect signatures for a recall referendum against Maduro. 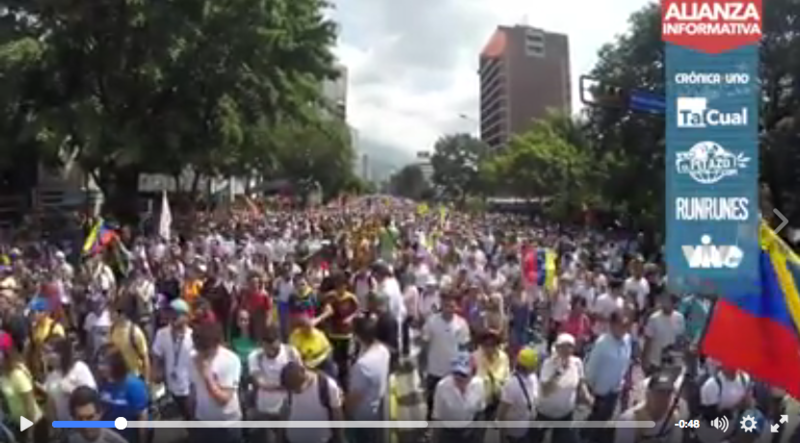 So, on Oct. 26, thousands of Venezuelans are participating in yet another massive protest against the current administration. This means that freedom of expression organizations were on alert for any restrictions that would block journalists from carrying out their work. For example, the organizations Espacio Público and the Press and Society Institute (IPYS Venezuela) reported through their Twitter accounts that Emmanuel Rivas, a correspondent of news site El Pitazo, was hit by pellets fired by police officials in the state of Mérida. According to reports, the journalist was wounded in the face, back and knee, and was treated by a medical service. Toward the end of the afternoon and with a partial accounting of the day, Espacio Público noted that the period had resulted in a “negative balance for the press” with at least 10 journalists who were victims. According to the organization, in addition to the journalist wounded in Mérida, three journalists were intimidated in Caracas, two were beaten with stones in the states of Maracaibo and Sucre, another was intimidated in Sucre, one was harassed and another detained in Monagas, and a tenth journalist was detained and beaten in Nueva Esparta. Just a day before the protests, old patterns seemed to be repeating. Peruvian journalists Ricardo Burgos, Leonidas Chávez and Armando Muñoz, from Mexican channel Televisa, and Argentine photographer Rodrigo Abd, from the Associated Press (AP), were detained at the Caracas airport on Oct. 25. Venezuelan authorities said they would be returned to their countries. A similar incident occurred prior to mass protests that took place on Sept. 1 when several international correspondents were also banned from entering the country. Additionally, freedom of expression organization Espacio Público recorded various violations, such as detentions, intimidations, assaults and censorship, against communications workers who were working to cover those protests. And earlier this week on Oct. 23, at least six journalists reported being assaulted, threatened and robbed after pro-government citizens violently entered the Venezuelan National Assembly. For today’s protests, freedom of expression organizations and journalist associations like Espacio Público, IPYS Venezuela and the National Association of Press Workers (SNTP) are again Tweeting any threats or attacks on journalists. They are also sharing infographics on how to safely cover protests or how to behave if detained. To cover the day’s events, several Venezuelan digital news sites formed an “information alliance.” News sites Crónica Uno, Tal Cual, El Pitazo and Runrun.es, as well as television platform VIVOplay, are collaborating on the project. The sites are publishing stories and sharing updates with a special banner naming all media involved in the coverage. 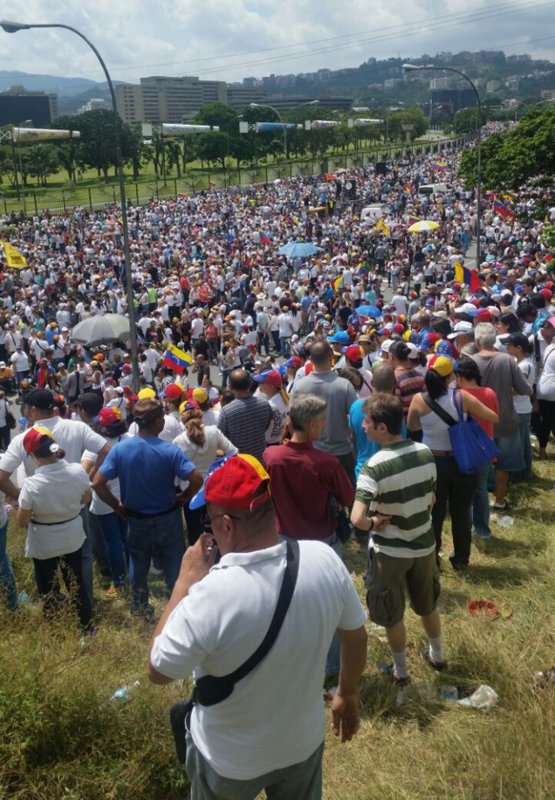 Journalists and social media users also are sharing photos, videos and text updates on the demonstrations with the hashtags #TomaDeVenezuela, #Toma26Oct and #TomaDeCaracas. *Silvia Higuera assisted with this story.